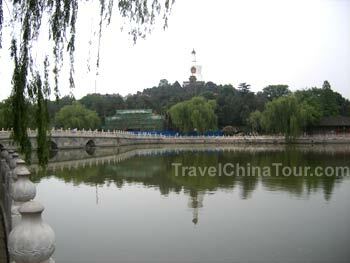 Beihai park is located just a little north of the Forbidden City in Beijing. It's about a 15 to 20 minute walk from the north gate exit of Forbidden City, so I decided to walk to Beihai park. I followed the road heading west (I think), asked several times for directions, and I was finally there! Beihai Park is located in central Beijing, and is one of the oldest and best preserved imperial gardens in China today. It has a history of almost 1000 years, lasting through the Liao, Jin, Yuan, Ming and Qing Dynasties. However, most of the buildings in Beihai Park today were constructed during Emperor Qianlong's regin during the Qing Dynasty. In 1925, Beihai Park was opened to the public, and placed under state protection program in 1961. The park covers an area of 69 hectares, including a 39 hectare lake. The most important site to see at Beihai park is the Qionghuadao island. You can see from the photo above, the stone bridge leading to the Qionghuadao island. During the Liao Dynasty in the early 10th century, a secondary palace was built on the island, and the lake around was expanded. Then the island was renamed to Qionghuadao, and the Palace of Bright Jade (Yao Guang Dian) was built. During the Yuan Dynasty, the island and the lake were included in the imperial city and were given new names WanShouShan (Longevity Hill), and Taiyechi (Celetial Pool). After crossing the long, stone bridge, it's about a 10 to 15 minute climb to the top of the hill. 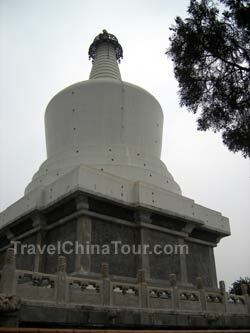 At the top of the hill, you will see the famous landmark, the White Dagoba. White Lamaist Dagoba at Beihai Park.